Fisker Surf | What Car? 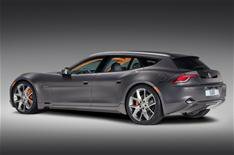 Fisker, the company behind the innovative petrol-electric Karma GT, is to launch a sleek, estate version of the car, called the Surf, in 2012. The Surf is identical to the Karma up to the central pillars, but then its roof straightens out instead of dropping away dramatically, so there's more rear headroom and a larger boot, which is accessed via a tailgate. You get 350 litres of luggage space when the rear seats are in place (up from the Karma's modest 195 litres) and 820 when they're folded. Just don't expect to squeeze in a chest of drawers; there's a huge step in the middle of the extended load area due to the presence of inverters for the electric powertrain beneath the floor. On the upside, a flap lets you divide the boot in two to stop smaller items sliding around, while self-levelling rear suspension ensures that the car stays level, no matter how heavily it's loaded. Like the Karma, the Surf is an electric vehicle with extended range. It's always driven by two electric motors, but has a turbocharged 2.0-litre petrol engine that acts as a generator when you want extra performance or the batteries run low. You charge the Surf from a conventional socket it takes about five and a half hours and can then travel about 50 miles on battery power alone, followed by a further 250 miles with the help of the generator (assuming you've brimmed the petrol tank). The Surf gets around the range-anxiety problem that has traditionally plagued electric cars, then, and while Fisker is still to confirm economy figures, we expect it to perform much like the Karma, which averages over 100mpg and emits just 83g/km of CO2. Prices are still to be confirmed, but Fisker says that the Surf will cost more than the 87,000 Karma. Fisker also plans to launch a Karma-based convertible, called the Karma Sunset, and a more affordable, BMW 3 Series-sized, saloon codenamed project Nina, in 2013. A Nina-based compact SUV will follow in 2014 and a Nina-based convertible in 2015.